Snowdon is the highest mountain in Wales, at an altitude of 1,085 metres (3,560 ft) above sea level, and the highest point in the British Isles outside Scotland. It is located in Snowdonia National Park (Parc Cenedlaethol Eryri) in Gwynedd, and has been described as "probably the busiest mountain in Britain". It is designated as a national nature reserve for its rare flora and fauna. The rocks that form Snowdon were produced by volcanoes in the Ordovician period, and the massif has been extensively sculpted by glaciation, forming the pyramidal peak of Snowdon and the arêtes of Crib Goch and Y Lliwedd. The cliff faces on Snowdon, including Clogwyn Du'r Arddu, are significant for rock climbing, and the mountain was used by Edmund Hillary in training for the 1953 ascent of Mount Everest. 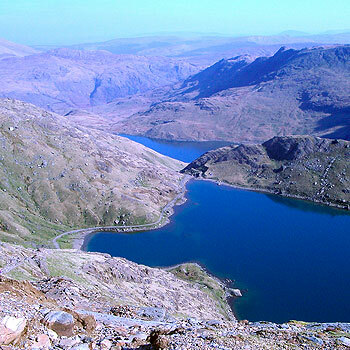 Snowdon boasts some of the best views in Britain, and the summit can be reached by a number of well-known paths. The summit can also be reached on the Snowdon Mountain Railway, a rack and pinion railway opened in 1896 which carries passengers the 4.7 miles (7.6 km) from Llanberis to the summit station. The summit also houses a visitor centre called Hafod Eryri, built in 2006 to replace one built in the 1930s.